Size: 46.5 x 35.5 cms. 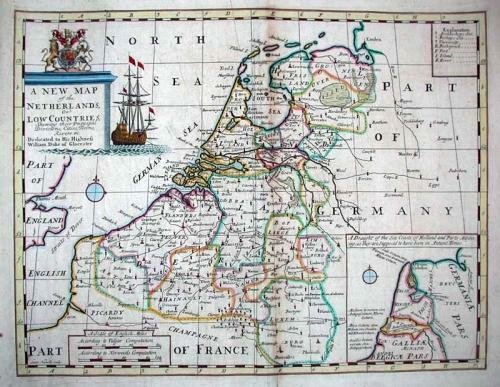 Title: 'A New Map of the Netherlands or Low Countries', from 'A New Sett of Maps both of Antient and Present Geography', an atlas compiled by the geographer and mathematician Edward Wells (1667-1727). The maps of this atlas are dedicated to the young William, Duke of Gloucester, Queen Anne's last surviving son and heir to the throne. William studied geography under Wells, but unfortunately died in 1700 at the age of 11 just as the first maps of the atlas were published. Wells designed his maps for instructional use in the geography courses he taught at Christ Church College at Oxford and his clear and direct cartographic presentation proved popular with the general public as well. Something of a surprise commercial success, the atlas received several printings well into the 1730s. The map is generally in very good condition and the colours are bright. Good quality laid paper, strong impression with distinct platemark, very attractive and skillful hand colour throughout. There is minor soiling throughout, and the soiling is more pronounced in the centrefold area which also has some very minor creasing. There are also a few minor soft creases throughout. The map has been professionally backed with linen as a protective measure by the Municipal Reference Library of Bath. This institution deaccessioned the atlas volume in which the map was originally bound, and there are two small embossed library stamps on the map.